Julianna Deering - The Drew Farthering Mysteries . 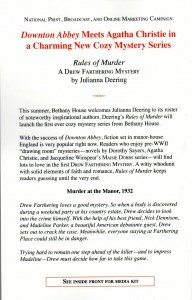 . . and more!Julianna Deering | The Drew Farthering Mysteries . . . and more! I’m SO excited! It should be on the shelves very, VERY soon! Death by the Book – Four Stars from Romantic Times! Just six more weeks, and Death by the Book will be on the shelf. I’m SO excited! 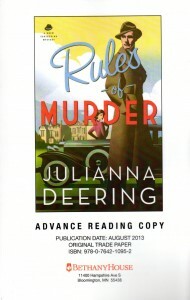 Bethany House has been sending me proofs for items for my upcoming cozy mystery, Death by the Book. Here’s the bookmark. Isn’t it great? 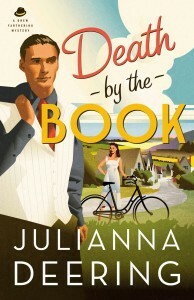 Death by the Book is due out on March 1st! David Suchet’s career as Agatha Christie’s most famous sleuth is at an end. 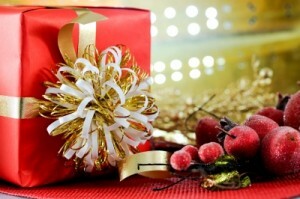 I’ve been so busy lately, I really haven’t had much time to get into the Christmas spirit. But this group never fails to inspire me. Bethany House has done a fabulous job (as usual). I am SO blessed to be with them! The absolutely wonderful people at Bethany House are doing a Goodreads giveaway for Rules of Murder starting tomorrow. I know I’m babbling like the wallflower who’s just been asked to her first prom, but Bethany House continues to be amazing in their treatment of my upcoming cozy mystery, Rules of Murder. They just sent me some review copies of the book. 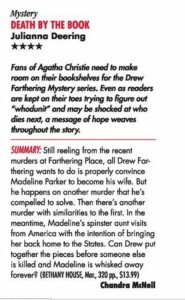 Not the final thing, of course, but just preview copies they send out to reviewers and other media people so they’ll know what they’re promoting. 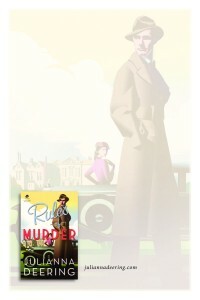 Then, to add more fun, they sent me the proof for the Rules of Murder notepads they’re creating as a giveaway for the book. I know it’s just a small thing, but it’s so beautifully done. 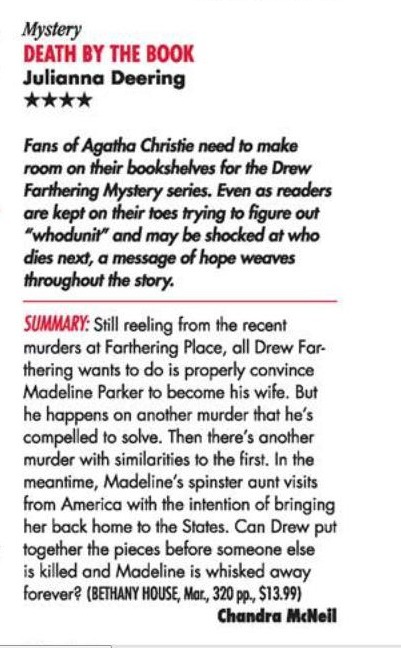 And I just love all they’re doing to give this book a good start. 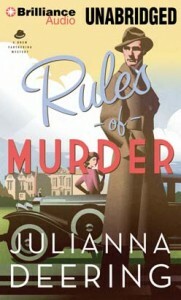 I just found out that my upcoming audiobook of Rules of Murder is scheduled to be read by Simon Vance. He is an AudioFile Golden Voice and Booklist magazine’s inaugural “Voice of Choice,” Mr. Vance has won two coveted Audie Awards and more than 20 Earphone Awards. 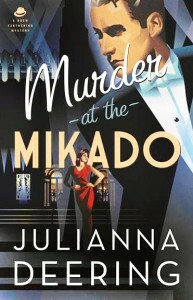 His range includes classics such as Dickens and Trollope, modern thrillers, and many nonfiction titles, including an AudioFile Book of the Year. I continue to be amazed at the treatment Bethany House is giving my book. It’s a total miracle, something only God could have brought about. I am so grateful to Him. I’m SO looking forward to hearing my story read in Mr. Vance’s beautiful English accent. Drew will be so pleased. I’m SO excited! 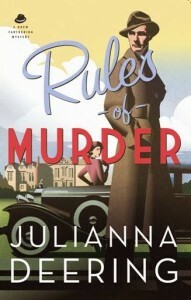 I just found out that Rules of Murder will have an UNABRIDGED AUDIO EDITION coming out on August 1st along with the paperback and e-book versions. The wonderful people at Brilliance Audio already have it on their website HERE. I can’t wait to find out who will be doing the narration. Richard Armitage? Kenneth Branagh? Patrick Stewart? Thanks for visiting my blog. If I have news about my books or anything writing related, here is where you'll find it. And you never know when one of my characters might drop in. Enjoy!